Laura Russell: "My goal as an artist is to open our minds to the visual and graphic landscape we look at every day but never really see. If we pay attention, we find that our urban landscape has a story to tell about our culture and our communities. For many years I have photographed vintage neon signs, brick wall ghost signs, graffiti and other examples of language and graphics in our environment. Recently, I have since expanded my photography to our urban social landscape. I use these photographs to create limited edition, hand-bound artist books that are at once a celebration of the vernacular and my own small effort to preserve our social, cultural and commercial landscape." Portland, Oregon: Simply Books, LTD, 2008. Edition of 25. 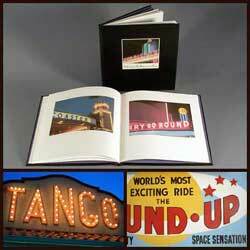 9 x 5.75 x 1"; 19 pages with 19 original color photographs. Single-layer horizontal flag book with cloth bound cover and ribbon tie (to display open). Archival digital printing on Mohawk Superfine paper. Includes an insert card with a map listing each attraction. Typography: ITC Franklin Gothic. Enclosed in a chipboard wrapper. Laurel Russell: "Highway 99 runs all the way from Canada to Mexico. In its heyday, Highway 99 was the main corridor through Washington, Oregon, and California. Replaced by Interstate 5 in the mid ' 60s, Hwy 99 still beckons with neon signs, shaped buildings, gentle giants and other roadside attractions that take us back to simpler times and happy road trips. This is volume one in a series featuring each of the three states. The 19 attractions featured in Hit the Road! are displayed in geographically correct order from North to South. "When I moved to Bellingham, WA in 2003 I was entranced by the neon signs, roadside giants and other roadside 'arti-facts' of Seattle's Hwy 99. I began driving the highway on regular trips to photograph these endangered beauties. Sadly, in just three years that I worked on shooting the photographs for this book some of my favorites were tragically lost. " Portland, Oregon: Simply Books, LTD, 2006. Edition of 25. 3 x 3" closed, extends to 28"; 16 pages. Archival inkjet printing on Janus Duo Card paper. Hedi Kyle's flag structure. Fabriano Ingres accordion spine. Grupo Stardream soft wrap around cover with velcro closure. Original poem and eight original photographs. Laura Russell: "On a visit to Barcelona I was completely captivated by Antoni Gaudí’s architecture. My husband and I saw every Gaudí site in town and were awed by the magic of his creations. What an amazing visionary and what an amazing city for preserving and honoring his work. "The eight photographs in this book feature Gaudí’s 'sentinels' atop his Casa Milà (La Pedrera) apartment building. These sentinels are rooftop chimney stacks, vent caps and stairway entrances disguised with huge, fantastical sculptures. "... I like to think that as you open the book the sentinels dance across the sky just as they do in my dreams of Barcelona." Portland, Oregon: Simply Books Ltd, 2004. Edition of 50. 5.5 x 5.5” opens to 42” Quotations laser printed on Mohawk Superfine paper. Paper collages on interior and cover. Electric blue suede leather cover. Presented in a matching slipcase. Signed and numbered. Inspirational quotes about creativity. Explores the innate need we all have to be creative in day-to-day lives. For some of us creativity is as vital to our survival as food and water. 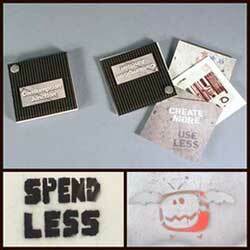 Urban Poetry is a series of artist books that explore various types of street graphics found in our urban environment. Portland, Oregon: Simply Books,Ltd, 2004. Edition of 200. 9 x 8.5"; 25 pages. 21 original photographs. Post bound with silver corrugated paper covers. Archival digital printing on Superfine paper. Laura Russell: "This book is the third in the Urban Poetry series exploring various types of street graphics found in our urban environment. The search for these images have taken the artist on many adventures in illegal art as she scours back alleys and street corners for the most interesting street art. The "posters" in this volume are intriguing from visual, social and poetic perspectives. Their messages tell us a lot about the current state of our society and culture." Portland, Oregon: Simply Books, LTD, 2002. Edition of 200. 9.5 x 8.5"; 18 pages. 16 original photographs taken by Laura Russell. Archival digital printing on Superfine paper. Post-bound with handmade paper covers. Titles on front cover in red spray paint. Urban stencil graffiti captured by the artist's digital camera. Laura Russell: "'Stop the Bombing' and 'Love is a Revolution'. These are just two examples of stencil graffiti found and photographed by the artist. The graffiti carries anti-consumer, anti-war, and pro-love messages and creates poetic and profound statements about the social issues of our times." 10 x 8.5" with 19 pages, printed on each side. Archival digital printing on Mohawk superfine paper of 34 original color photographs. Colfax Avenue is an amazing street. Its past is a colorful history of roadside landmarks and infamous travelers. Today the avenue is a different kind of colorful but still vibrant and very much alive. Russell presents a photographic journey down Denver's infamous Avenue. 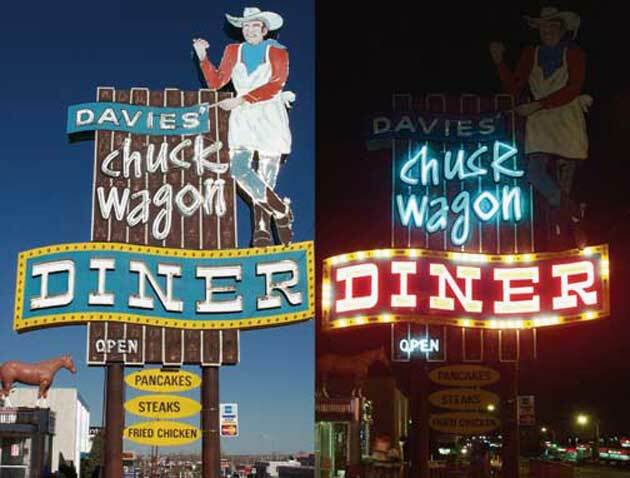 Nighttime and daytime photographs of fast-disappearing vintage neon signs are presented side-by-side to see how the soul of the street transforms day to night. 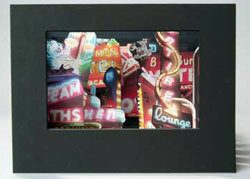 Laura Russell: "I started taking photographs of vintage neon signs during my years as a graphic designer. I was looking for examples of interesting fonts or typography to use in my graphic design projects. Now my efforts to photograph these signs are not only a study of our graphic history, but also my own small effort to document and preserve our ephemeral cultural landscape. Vintage neon signs are endangered by the development and growth of our urban areas and very few preservation efforts. Most of the signs I photograph were built between 1930 and 1960. Colfax Avenue was the main road through Denver before I-70 was built in the early 1960s. It was famous as a tourist stopover with kitchy hotels and roadside attractions. And it became infamous through the writings of authors such as Jack Kerouac. Denverite's still claim their beloved Colfax to be "the longest continuous street in America" as it travels more than 20 miles though the heart of downtown Denver from the foothills to the plains. 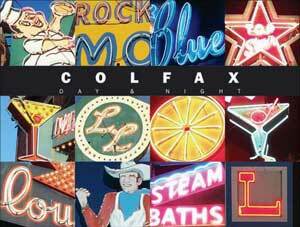 Today, parts of Colfax are enjoying a redevelopment boom, which threatens its aging strip joints, cheap motels, dive bars and liquor stores. Sadly, this intriguing visual and cultural landscape will slowly fade into the sunset. I shot the photographs for this book during my last few months living in Denver. As we prepared to move to the Pacific Northwest, I became very sentimental for this town that I called home for almost 20 years. I felt a need to shoot these signs as if they were friends I would never see again. I will always miss Colfax Avenue and its vibrant soul." Portland, Oregon: Simply Books, Ltd., 2002. Edition of 200. 3 x 3" miniature with 14 pages. Post-bound fan-book structure. Digital printing with archival inks on Mohawk Superfine paper. 12 original photographs. Signed and numbered. Laura Russell: "Consumerism and simplicity are two themes that show up frequently in my work. Consumption Junction, classified as a “miniature book,” is a compilation of photographs of stencil graffiti found around Denver and New York City. “Consumerism Kills” and “Create More Use Less” are two of my favorite statements on the consumption-driven monoculture that is so prevalent in our world today. Stencil graffiti is an underground street art form where a message or image is out of a stencil and spray painted onto buildings or sidewalks, allowing the artist to repeat his message many times. While most people see graffiti as vandalism, I also see graffiti as the desperate pleas of our inner city youth. They want their messages to be heard and their art to be noticed. Graffiti can be both a form of urban protest and artistic expression." 2.75 x 2.65” with 32 pages. Case bound in leather or cloth. Original digital photography printed using archival digital printing on Mohawk Superfine paper. Lakeside Amusement Park in Denver was billed by ambitious investors in 1908 as the "Coney island of the West." This photographic artist book explores the timeless architecture, graphics, signage and neon of this once-glorious, world-famous theme park. Visitors today are surrounded by art-deco buildings bathed in neon, the original, but tired 1908 carousel, and abandoned rides that are skeletons of their former glory. Laura Russell: "For nearly ten years we lived in house on a hill in Denver. From the kitchen window I could see a blue neon glow emanating from Lakeside Amusement Park. I could see the grand entrance tower studded with old-fashioned light bulbs. Most of the rides are old-fashioned carnival-style rides untouched by the modern monsters. Several abandoned rides stand right in the middle of the park overtaken by weeds and rust. Most of the buildings inside the park have an untouched art deco aesthetic. Almost every ride, picnic pavilion or game stand is bathed in neon light. I was stunned by the typography and graphics used on the signage throughout the park." 2.13 x 3", 32 pages. Long stitch binding into paper cover. Archival digital printing on Superfine paper. 26 original photographs. Signed and numbered. This miniature ABC book contains photographs of letters found on vintage neon signs. The alphabet letters are paired with terminology and fun facts from the fascinating world of neon science and artistry—a world that has changed little since the invention of the neon sign in 1910. Laura Russell: "I absolutely adore old neon signs. They are quirky and fun and animated and boy, they just don't design them like they used to! This love affair started several years ago while I was photographing examples of lettering in the landscape to use in my graphic design projects. Even today, I stop and photograph any old neon sign that I see wherever I travel. Words and letters from these vintage signs are a fascinating study of our commercial design history." 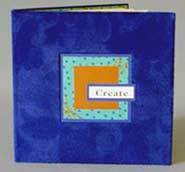 8.5 x 6.25 x 1” Tunnel book with detachable cloth-covered, three-panel, wrap-around cover. Archival digital printing on Mohawk Superfine paper. Original poem on inside covers by the artist. Original color photographs. Signed and numbered. Presented in a clamshell box. Feel the sizzle of electricity, the sparkle of a million lights. Neon lights up our skylines and enlivens our nights. The street at night is a symphony, orchestrated by automobiles, pedestrians, sirens and honking horns. Nocturne captures the music of the night in a tunnel book format, forever preserving the romance, the dreamy melody that is the city street at night. Peering into the tunnel, the viewer is transported to the street as their mind conjures up memories and nostalgia for the sights and sounds of bygone days. All original color photographs were shot on Denver’s infamous Colfax Avenue.